We answer questions about production tricks for you. Is coal dust (activated coal) used in sugar production? In the first years of sugar technology, coal dust was used due to bleaching feature in refinery. However, there is no need to use such bleaching agents with today's modern sugar production technology and these formerly used systems have been abandoned. What are the socioeconomic contributions of sugar beet? Sugar beet is a plant that both increases producers' income and provides employment. Sugar beet is a plant which gives immigration from rural to urban a pause, which is the most useful product having no alternative for our villagers and our country, which would have to be invented if there was no such a thing because it provides added value, its by-products can be animal feed and it provides employment in agriculture. In our country where arable agricultural land's limit is reached, main condition of increasing farmers' income more depends on family workforce of our farmers, benefiting from agricultural land and animal presence at the highest level. Income levels of small agricultural enterprises whose agricultural land and animal presence are insufficient and which may immigrate to city at any time, should be increased. Beet farmer brought 1,7 million decares of barren agricultural land in irrigated farming. Beet farmers try to get the highest yield from the unit agricultural land by making sprinkler irrigation for sugar beet and wheat with diesel engine and sprinkler material which they can buy with their own savings. What are the general information about beet sugar production in Turkey? 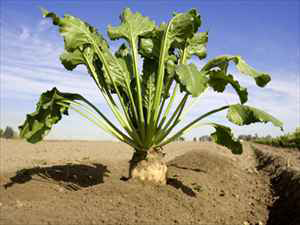 Sugar beet is a rotation plant which can be grown in generally high-altitude regions, irrigated grain cultivation areas. Sugar beet is planted in the same field once in four years. Sugar beet is a plant which is cultivated in 65 provinces and 8 000 settlements except Aegean, Mediterranean coastal zone, Eastern Black Sea, Southeast Anatolia regions in our country. Average 350 000 farmer families deal with beet farming in a year. Beet Sugar industry has managed to become an agricultural industry bringing modern agricultural techniques to Turkish agriculture, developing and using knowledge and technology. It created organized and conscious farmers community and tillage, planting, maintenance, planned and advanced agricultural system in terms of harvest not only for sugar beet but also for other products grown during rotation period in sugar beet areas. In areas where sugar beet is grown, beet producer made significant progress in corn production, in addition to this, beet areas have been promising for colza production in suitable ecology and suitable farming practices. Sugar beet production model, its fabrication and farmers organization make effective planning and production of the products which lack in production in beet areas possible . In areas where sugar beet production disappears, proper product pattern planning and productivity are not achieved. 6 of 33 factories producing sugar from beet available in Turkey belong to Pankobirlik, one belongs to Pankobirlik and private sector partnership (Kütahya Sugar Factory), one belongs to private sector and 25 belong to Türkşeker. Daily beet processing capacity of available 33 sugar factories is approximately 175 thousand tons, their annual sugar production capacity is approximately 3,2 million tons. There are annual total 1,9 million tons of sugar capacity in factories within the structure of Türkşeker, 57,6 million liter of ethyl alcohol capacity in 4 alcohol factories, annual 1.200 tons of calibrated and high genetic potential seed production capacity in seed processing factory. Also, field crops production and animal husbandry activities are carried out in 2 agricultural enterprises and R&D service is provided with 1 research institute. Another important establishment in the sector is Pankobirlik. 6 sugar factories consisting of Adapazarı, Amasya, BoğazlıyanÇumra, Kayseri and Konya within the structure of Pankobirlik which is our country's one of the biggest non-governmental organizations and Kütahya factory of which it is a partner meet approximately 40% of the sector's production. As a result of implementing controlled technical agricultural system of Turkey's Sugar Industry, it can easily compete with the world and EU in terms of beet yield and production quality. Besides capacity increase investments, cooperative factories have become capable of competing with EU easily by lowering production costs to minimum levels in factories whose productivity has been increased with technologies used. What is the importance of sugar beet farming for our country? - Sugar beet is a main driving force in agriculture and regions where sugar farming is performed are good examples of production branch. - In our country, 10% of total consumed fertilizer is used in sugar beet farming and again, 20% of total consumption is used by beet producers. - It has become the pioneer of planned production and rotation practice, popularized irrigated agriculture. - A decare provides employment for approximately 10 workforces. - It is in the 2nd place in terms of added value it provides in industrial plants. - It provides 20% increase in the yield of grain planted after it. - If its heads and leaves are left in the soil, it provides a decare with nutrients equivalent to 4 Kg. pure phosphate, 15 Kg. pure potassium. it increases possibility of using underground and surface water resources. - During hoeing and harvesting periods, it provides employment for 250.000 people who don't have land, don't have much land and are unemployed for 100 days. - Approximately 350 thousand families carry out sugar beet farming annually and employment is provided for 30 thousand people in factories. - Workforce in the family is utilized in 40% of cultivation areas. - Its is cultivated in total 74 provinces and approximately 7000 settlements and all irrigated areas in our country except Aegean-Western Black Sea-Eastern Black Sea-Mediterranean and Southeast Anatolia regions. - 30 decares of beet farming carried out by using workforce in and/or out of family provides 1 full employment in agriculture. While 1 ton 400 decares employment is provided in agricylture with 48 decares of beet farming for which machine is used in maintenance and harvest works, 1 full employment is provided in corn farming for which machine is used, 800 decares wheat farming provides 1 full employment. Corn and Wheat farmings have been mechanized in our country. - Animal nutrition value of beet pulp, beet heads and leaves and molasses which are by-products of 1 decare of sugar beet, equals to 500 kg of barley. When one decare of sugar beet is planted in a field, it can be deemed that 2 decares of barley was also planted. - Molasses obtained as a result of processing sugar beet in the factory is the main raw material of the yeast industry. Yeast produced from molasses is exported to 80 countries and provides foreign exchange inflow. - Oxygen that a decar releases to air through photosynthesis, equals to oxygen consumed by 6 people in a year and it produces 3 times more oxygen than the same forest area. For this reason, it is an important environment-friendly industrial plant that has to be cultivated. - If fossil fuel is used during processing 1 decare sugar beet in the sugar factory, it releases 26 times more oxygen than carbon dioxide released to air, 48 times more oxygen than oxygen needed to treat pollution caused by waste water through photosynthesis. Sugar beet is an environment-friendly plant. What are the benefits brought by sugar beet farmers to our country? Sugar beet farmers brought 1 700 000 decares of agricultural land to irrigated agriculture with their own investments without being a burden to government. In transition from dry farming to irrigated farming, with inclusion of sugar beet in rotation and performing 3 years of irigated wheat + 1 year of sugar beet farming instead of wheat farming which can't be irrigated, employment increase in agriculture is 23 hours/decare per planting decare. Employment/investment value of employment provided by sugar beet farmers by bringing 1.700.000 decares of agricultural land to irrigated agriculture with their own investments is equivalent to 1,6 billion dollars/year. Area provided by beet farmers for irrigated farming is equivalent to 2 year irrigation water supply investment amount of DSİ (General Directorate of State Hydraulic Works) and KHGM (General Directorate of Rural Services). Making sugar factories work with unutilized capacity, forcing farmers to farm grains instead of letting them to cultivate beet in fields suitable for planting beet in rotation field are major mistakes preventing us from developing. Why are sugar beet production and sugar industry important? In a period when biofuels that can reduce foreign dependence in energy, have gained importance (bioethanol produced from sugar beet is the most advantageous product in terms of cost), strategic importance of sugar factories and therefore, growing sugar beet increases more. How is sugar beet produced? It doesn’t require abundant moisture during growing period and it doesn’t require abundant rainfall during ripening period. (For this reason, it doesn't grow in Eastern Black Sea region coasts much). Sugar beet farming is largely based on human labor. Sugar beet is mostly produced in our hinterlands. Central Anatolia meets almost half of the production. Due to insufficient irrigation, planting area is not widespread in Southeast Anatolia. Because sugar beet needs to be processed right after harvest and long distances increase transportation costs, cultivation areas are close to sugar factories. For this reason, geographical distribution of sugar beet is parallel to the geographical distribution of sugar factories. Because its pulp is used as animal feed, livestock and barn animal breeding are intense around sugar factories. What is the importance of sugar beet? - It grows in Central Anatolia conditions and there is no alternative for it. - It improves socio-economic situation of rural area. - In the regions where its cultivation is made, it obligates farmers to stay in the field and prevents immigration from village to city. - It provides employment for approximately 10 workforces in 1 decare. - It is pioneer of rotation, planned production and irrigated agriculture. Because sugar beet farming made with rotation system leaves well-kept field, it provides yield increase in products to be grown after it. As a matter of fact, this yield increase may be up to 20% in wheat. - Approximately 450 thousands of farmer families in our country make their living by growing beet. Are there any additives in granulated sugar and cube sugar? Neither cube sugar nor white crystal sugar contains any additive. It shouldn't be forgotten that sugar is one of the purest foodstuffs with 99,9% purity. How many kilograms of beets are needed to obtain 1 kilogram of granulated sugar? Depending on sugar contained by sugar beet used in the production of sugar, 1 kg of white crystal sugar is obtained from 7-8 kg of beet. How long is the shelf life of crystal sugar? White Crystal Sugar is bagged in our Konya and Çumra Sugar Factories with fully automatic machines without touching by hand and their bags' openings are sewn. Used polypropylene sacks come in cardboard boxes and are opened during filling process for the first time. In other words, sugar is produced and packaged under extremely clean conditions. Because shelf life of a foodstuff directly depends on its cleanliness as well as the physical and chemical structure of this foodstuff, it can remain unspoiled for a long time before use or during use if it is kept in cool and dry place. As moisture within the structure of sugar is very low, if the sugar whose package is opened is kept open, after a while, sugar moistens by absorbing the moisture around it and as a result, this may cause caking. It is the best to keep the package closed during use in order to protect the sugar from external influences. How is cube sugar produced? Cube sugar is made from crystal sugar which is called granulated sugar in colloquial speech. In cube sugar production, sugars whose crystals are not too large are preferred. Cube sugar producers supply crystal sugar from sugar factories because of market conditions. In brief, cube sugar production is the process of pressing crystal sugar with molds with certain shapes cube sugar machines and then drying. Additional materials aren't added during the production phase. Cube sugar doesn't fall apart because steam is used during the process. Why was cube sugar used to leave oil on the surface of tea in the past? During the production of cube sugar, auxiliary products were used for removing sugar cubes from the mold easily in the past. Although these substances weren't harmful to health, they might remain on the surface of sugar even in very trace amounts and when sugar was mixed with water (for example tea) during use, it could cause undesirable different appearances. However, these types of materials aren't used in cube sugar production with new methods today, such situations aren't encountered. Brown sugar is sugar obtained by mixing white crystal sugar with some sugar cane molasses which is pre-processed and brought to food purity. It is called "brown sugar" because its color is brown. Why is limestone used in sugar production, what is it for? Limestone is one of the auxiliary raw materials in sugar production process and it is used as lime milk in treatment process of raw syrup in sugar manufacturing. Lime milk is prepared by slaking unslaked lime which is obtained from limestone (CaO) and raw syrup is treated with this lime milk [Ca(OH)2] in treatment station. However, filtration phase following treatment, all the lime residues added to the system are removed completely from the syrup together with other solid substances except the sugar from the beet and refined syrup is obtained. This syrup is further processed and white crystal sugar that we know is produced and no lime residues remain in the sugar structure. Is sugar diabetic patients consume produced from beet? The word sugar is sometimes used as general name of the flavoring substances in colloquial speech. But in general, sugar means the substance in the form of a sweet white crystal whose chemical name is "sucrose". Sugar which is obtained from sugar beet and sugar cane is "sucrose". Sucrose is digested in the body and it turns into glucose and fructose which are a kind of sugar, it is used by the body as an energy source. If we roughly describe diabetes, it means that amount of glucose in the blood is above normal values and for this reason, diabetic patients can't use sucrose or sugar in this class. Instead of this, they use chemical sweeteners that are sweet but not sugar or sugar derivatives. Therefore, these chemical sweeteners aren’t produced from sugar beet or sugar cane because they aren’t classified as sugar. However, substances should be used absolutely according to doctor's recommendation. Structure of sugar obtained from sugar cane and structure of sugar obtained from sugar beet are "sucrose". Roughly, there isn’t any difference. However, since effects of trace amounts of organic and inorganic substances coming from structures of both plants on crystallisation may be different, structures of cane sugar and beet sugar may be slightly different. Are tastes of sugar produced by different plants different? - Taste of the tea that you drink in the morning may not even be the same with the taste of tea that you drink in the evening (ven if you put the same sugar). Finally, taste is a sensory fact and it is a perception that a person feels on his/her tongue. Sometimes, perception may change with directions. When there are such differences, a correct comparison can't be made. For example, one gram of sugar will always taste the same. However, a person may not always feel the same perception. There is no difference between the tastes of sugar produced by different factories. However, there might be other differences determining customer preferences such as hygiene, quality, customer satisfaction, certification, etc.